There’s more to jasmine than delicate tendrils and sweet perfume. Explore these hardy forms which lend substance, structure, and colorful blossoms to West Coast gardens. Common in the Pacific Northwest, winter jasmine (Jasminum nudiflorum) is a far cry from its summer-blooming fragrant kin. 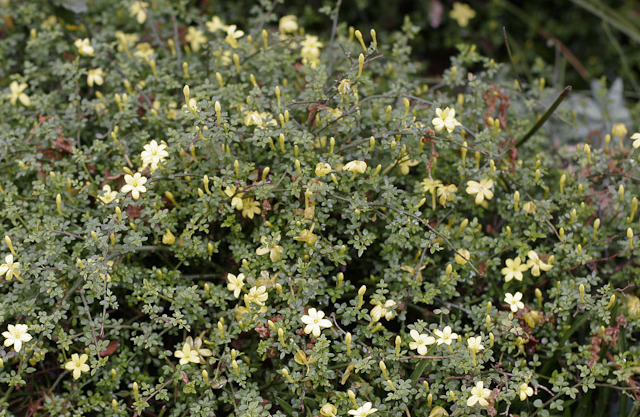 This spreading deciduous shrub adorns its bare green stems with yellow flowers beginning in mid-winter. Though scentless, they are a welcome beacon during the darkest days of the year. 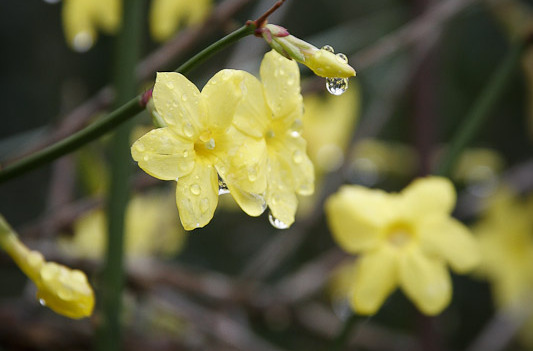 Hardy to temperatures below zero, winter jasmine can be cultivated on both sides of the Cascades. A hard freeze will interrupt flowering, but new buds continue to emerge and open on mild days. Here in Oregon, winter jasmine is planted along the freeways in Portland where its arching and spreading stems root advantageously wherever they meet the ground and its sunny flowers decorate the roadside. 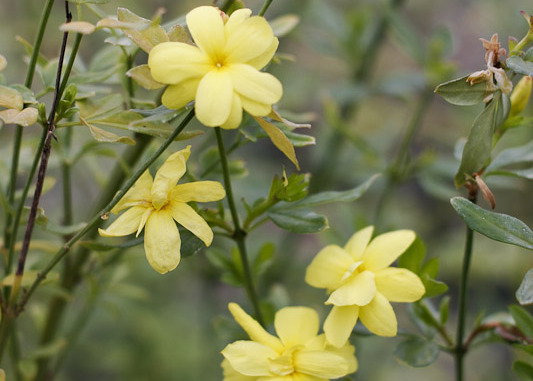 Winter Jasmine is not fussy about soil but performs best with some irrigation in summer. It is adaptable to full sun to light shade and grows 3 feet tall by 7 feet wide as a free standing, arching shrub. When trained up a wall on a lattice or trellis winter jasmine creates a striking display on gloomy days when a vertical wall of butter yellow flowers invokes the winter sun. Jasminum nudiflorum blooms on wood from the previous growing season and should be pruned, if needed, right after flowering. Bare stems harvested and brought indoors are easily forced into bloom for winter arrangements. J. n. ‘Mystique’ Variegated stems and leaves are margined in cream extending its garden impact long past its winter bloom period. J. n. ‘Aureum’ Irregularly splashed or sometimes entirely golden leaves, while not as bright as the winter blossoms, present a welcome second season of interest in summer. 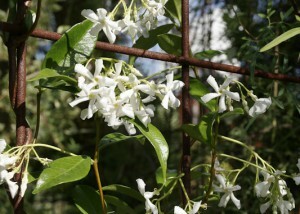 Himalayan jasmine (J. humile) is a willowy shrub growing to 6 feet tall, with grass green pinnate leaves. Deciduous when temperatures fall below 20ºF, this plant does best in a protected location. An adaptable plant, it grows and flowers well in full shade to full sun producing a continuous display of softly fragrant clusters of nodding, light yellow flowers beginning in late spring and continuing until frost on new growth. It is at its best in woodland conditions where its fine texture provides a transparent scrim. Though tough and drought tolerant, Himalayan jasmine performs best with occasional water in summer. You can’t go wrong with this delightful plant. J. h. ‘Revolutum’ Larger in all aspects than the straight species, this remarkable and vigorous form of Himalayan jasmine appears to be on steroids. Large flowers to one inch across have a wonderful penetrating fragrance reminiscent of roses and are borne in multiple clusters on tall supple stems growing to 12 feet that lend themselves to training like you would a climbing rose on a wall or a trellis. In full sun, it may be grown as a very large free standing shrub. Full sun and regular water in rich soil will send this plant speeding along. Italian jasmine (J. fruticans) is deciduous shrub of great endurance native around the Mediterranean. With rounded, twiggy growth to four feet tall by six feet wide, it produces masses of brilliant yellow, lightly fragrant flowers for weeks in early summer. This is a shrub for the toughest locations; it thrives in poor soils with little water in full sun. Very cold hardy, this variety should be tried east of the Cascades. On the west side of the mountains, Italian jasmine blooms concurrently with Ceanothus and appreciates the same cultural conditions creating a beautiful and classic garden composition of blue and yellow flowers. Dwarf hardy jasmine (J. parkeri) is a wonderful miniature deciduous shrub that is charming in all aspects. Tightly growing to only two feet tall and barely three feet wide after 10 years, it covers itself in fragrant yellow flowers in early summer followed by decorative, small black berries. Very easy to grow in any well-drained soil, dwarf hardy jasmine tolerates hot, dry locations though supplemental water will often spur it into bloom for a repeat performance of the early summer show. Its habit makes it a natural for rock gardens or it may be grown as a short hedge. Primrose jasmine (J. mesnyi) is an arching shrub to three feet tall and spreading to six feet wide. In mid-spring it is clad in fully double primrose yellow flowers that appear for weeks. Well known in California and other warm climates, primrose jasmine is less common in Pacific Northwest gardens where it is somewhat tender, suffering moderate dieback when temperatures drop below 15ºF. It thrives in full, hot sun and well drained soil, is supremely drought tolerant, and recovers nicely after a hard winter to bloom again. Bee’s jasmine (J. beesianum) is a remarkable vine native to China that is cultivated for its small but deep velvet red flowers that bloom on twining stems to 10 feet tall. Though not fragrant, the blossoms are charming and not at all like the rest of the genus. Bee’s jasmine thrives in full sun to part shade, is drought tolerant, and very hardy to cold enduring temperatures below 0ºF making it another good candidate for gardens east of the Cascades. Not related to jasmine at all, star jasmine (Trachelospermum jasminoides) is a member of the dogbane family and hails from China where it has been grown for its powerfully fragrant flowers for centuries. Ivory pinwheel shaped blooms appear throughout summer in the Pacific Northwest and beginning in spring in warmer regions. A twining evergreen shrub with growth to 12 feet, star jasmine may be trained as a vine or as a handsome groundcover in full sun to part shade with supplemental water during the warm summer months. The last ten years has proven this plant sufficiently hardy to be grown in western Washington and Oregon. Unoriginally known as pink jasmine, or sometimes as Stephens jasmine, J. x stephanense is a hybrid between Bee’s jasmine and poet’s jasmine (J. officinale). A vigorous twining vine to 20 feet supporting masses of lightly fragrant flowers in late spring and then sporadically throughout summer. The foliage often emerges variegated with splashes of cream. Pink jasmine is fast growing and requires little care to thrive–just be sure to give it a lot of space. It inherits cold hardiness from its two parents tolerating temperatures to 0º without ill effects. I grew this vine in an area where deer frequently browsed. The plants, like other jasmines I have planted, remained untouched. Tough, resilient, and ornamental, Jasmine in all its many forms earns a spot in my garden.